If processed properly and according to code requirements, recycled slag can be a reliable and feasible alternative to buying new flux. Recycling fused slag from the SAW process is economical and environ­mentally friendly. Submerged arc welding (SAW) slag is recycled by taking the fused part of the slag after welding and processing it in a manner that allows it to be reused for the same SAW operation. This slag recycling process has been around the welding industry for many years, and trial-and-error experimenta­tion through the years has made it a re­liable and accepted process. Two major reasons why a welding manufacturer would consider the use of recycled submerged arc welding slag are cost savings and the environment. The cost of processing recycled slag is less than the purchase of new flux from the manufacturer. Many times this can amount to savings of 50% or greater. Savings can also be realized by eliminating the need to collect the slag and have it removed to an approved landfill. Environmentally, recycling slag min­imizes the use of nonrenewable resources such as minerals, and it reduces the mass of material that must be sent to a landfill. It should be noted, though, that in most recycling processes there is some loss in weight, and not all the slag is processed into reusable flux. Also, there is magnetic separation during process­ing in which magnetic impurities are re­moved and disposed of as waste. An av­erage for this loss is 25% of the total weight processed. To realize all of the advantages of re­cycling, it is essential that the process is performed properly and according to the standards established by industry. Below are steps required for recycling slag as established by two standards set­ting organizations. The recycling of submerged arc welding slag for use in welding opera­tions that are in accordance with the American Welding Society (AWS) Struc­tural Welding Code, 01 .1-94, requires that each time the slag is recycled it be tested. All welding and testing presented in this report was performed by an in­dependent third party who was neither a part of the welding manufacturer’s nor the slag processor’s organization. The Structural Welding Code also states the frequency of testing shall be in accordance with the AWS Filler Metal Procurement Guidelines, AS.01-87. This publication states that the required testing shall be performed for each lot shipped. The testing required is in accordance with either the AWS Specification for Carbon Steel Electrodes and Fluxes for Submerged Arc Welding, AS.17-89, or the Specification for Low Alloy Steel Electrodes and Fluxes for Submerged Arc Welding, AS. 23-90. The testing examined here was in ac­cordance with AWS AS.17-89. The test coupon was a 1-in. (25-mm) thick plate welded with backing bar using 5/32-in. (4.0-mm ) diameter electrode, and the AWS classification was EMl 2K. The welding parameters used were 550 A di­rect current electrode positive (DCEP), 28 V, and 15 in./min (6.3 mm/s) travel speed. The test coupon was large enough to remove five Charpy V-notch samples, a chemical analysis sample and one all-weld-metal tension speci­men. For complete details of the test coupon, welding parameters, location and number of test specimens refer to Specification for Carbon Steel Elec­trodes and Fluxes for Submerged Arc Welding, AS.17-89. The objective of this testing was to classify the recycled slag as an F7 A2-EM12 K, which means the testing of the coupon welded with the recycled slag will produce weld metal with an as­welded tensile strength no lower than 70,000 psi (480 MPa) and Charpy V­-notch impact strength of at least 20 ft-lb (27 J) at -20°F (-29°( ) when produced with an EMl 2K electrode under the con­ditions called for in AWS AS.17-89. The welding of the test coupon was performed with 100% recycled flux. Fig. 1 – Arrangement of test specimens from certification testing. The results are from a manufacturer that welds daily. There was no attempt to control using the exact same slag from the previous recycling. The first time this slag was recycled, the welding manu­facturer had generated the slag from new flux known by the trade name Lincoin 860. Figure 1 shows the general arrange­ment of the Charpy V-notch specimens, the mass spectrometer specimen and the all-weld-metal tensile specimen. Table 1 gives the results of the chemical analysis performed on the recycled SAW slag. Chemical analysis for the first through fourth recycle was performed by the wet analytical method, and the location for analysis was the reduced section of the fractured all-weld-metal tensile specimen. Chemical analysis for the fifth and sixth recycle was performed by mass spectrometer taken from a low­dilution area of the weld test coupon.For carbon, manganese and silicon, the A5.17 specification states both a minimum and a maximum. As can be seen in Table 1, all values for the weld tests made from the recycled SAW slag fall within the ranges for carbon, man­ganese and silicon. As for sulfur, phosphorus and copper, which can be considered contaminants in the weld metal, the A5.17 specifica­tion states a maximum value. Table 1 shows that the levels of sulfur, phospho­rus and copper in the weld tests made with recycled SAW slag fall below these maximums, and in most cases, well below. Fig. 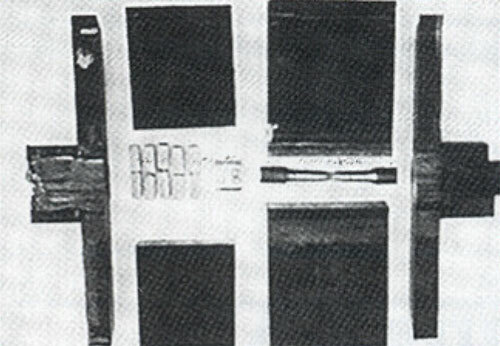 2 – Arrangement of test specimens from qualification testing. Table 2 shows the results of the all-weld-metal tensile specimen taken from the weldc oupons welded with the recy­cled flux and also the results of radiographic testing of these same weld coupons. 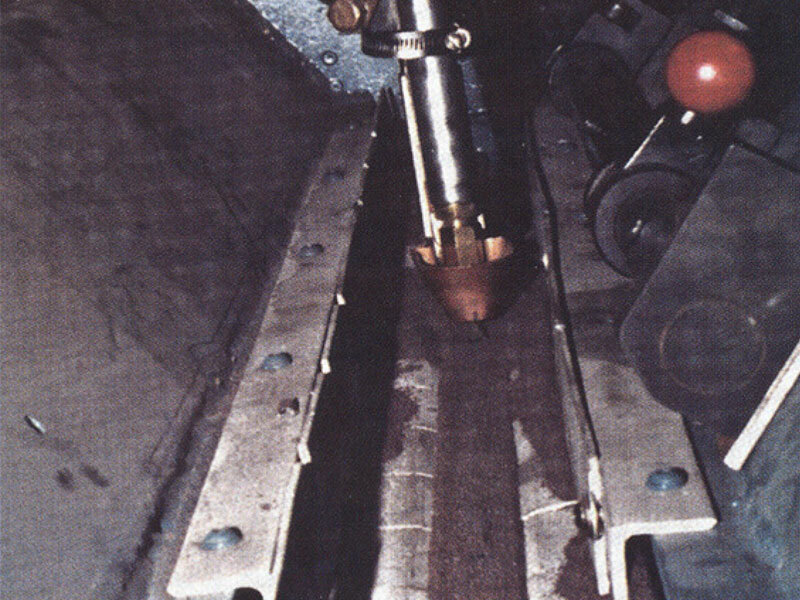 The radiographic tests of each weld coupon demonstrate the ability of the recycled flux to produce welds of radiographic quality.The welds are exam­ined by nondestructive testing in accordance with The American Society for Testing Materials (ASTM) method El 42 Controlling Quality of Ra­diographic Testing. The quality level of inspection was 2-2T. The acceptance criteria was as defined in A5.17. As Table 2 shows, the weld coupons made with SAW slag have the ability to produce sound welds when examined by the radiographic nondestructive test­ing method. All six welds coupons made with recycled SAW weld flux were acceptable in accordance with the radi­ographic acceptance criteria. The A5.17 specification states that the all-weld-metal tensile specimen shall have a minimum yield strength of 58,000 lb/in.2 (400 MPa) and a tensile strength of 70,000 lb/in.2 (480 MPa) minimum and 95,000 lb/in.2 (650 MPa) maximum. Table 2 shows that the minimum yield strength was exceeded and the tensile strength was within the accept­able range for each of the six all-weld­-metal tensile specimens taken from the coupons made with the recycled SA welding slag. The specification states that the min­imum elongation in the 2-in. (50.8-mm) gauge length of all-weld-metal tensile specimen shall be 22%. There is no re­quirement defined for the reduction of area in the all-weld-metal tensile speci­men, but it is reported in Table 3 be­cause it was very easy to obtain since the specimen was already available. Table 2 shows that all tensile speci­mens made from the six weld coupons exceeded the minimum requirement of 22%. The reduction in area of the all-­weld-metal tensile specimen is reported for information only. The A5.17 specification states that five Charpy V-notch specimens shall be machined from the weld test coupon and tested at the temperature for the classification required. In evaluating the results, the lowest and highest values obtained are disre­garded. Two of the remaining three val­ues used to calculate the average must equal or exceed the specified 20 ft-lb and none of the remaining three may be less than 15 ft-lb (20 J). Table 3 shows that of the Charpy V­-notch specimens machined and tested from the six coupons welded with recy­cled SAW flux all met this criteria. The samples were tested at -20°F. 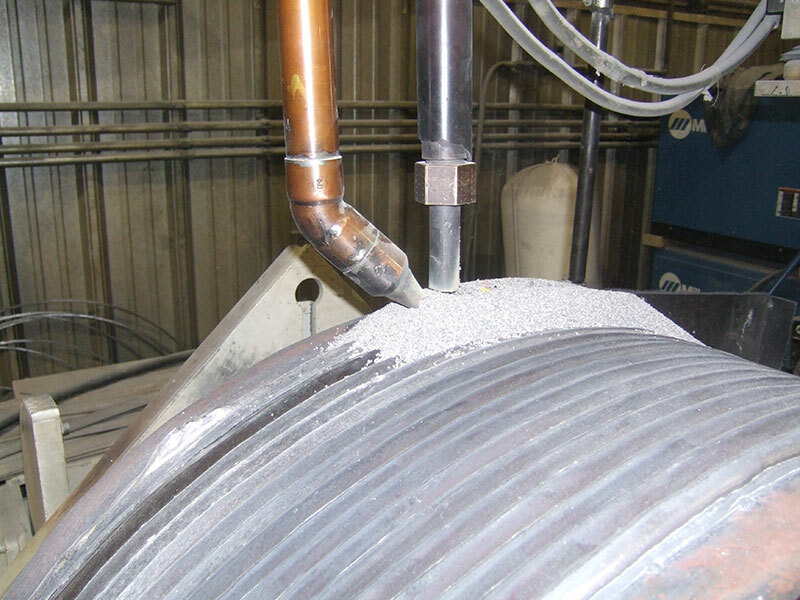 The recycling of submerged arc welding slag for use in welding opera­tions that are in accordance with the American Society of Mechanical Engi­neers (ASME) Boiler & Pressure Vessel Code Section IX, Welding and Brazing Qualifications, requires that each time the slag is recycled it be tested. But as an alternative to the certification testing and classification as described above, a welding manufacturer may also choose to perform a welding procedure each time the SAW slag is recycled. The re­cycled flux is then considered an un­classified flux. The procedure qualification used in this report was performed on 3/8-in. (9.5-mm) plate with a single V-groove and backing bar. The base metal is P No. 1 as designated by ASME Section IX. The welding was performed with a 5/32-in. (4.0-mm) diameter electrode (AWS EM1 2K) with direct current electrode positive. The welding of the test coupon was performed with 100% recycled flux. The objective of this testing was to per­form procedure qualification testing and meet all the criteria required by ASME Section IX for the intended application by the welding manufacturer. The requirements stated that the weld coupon be tested in the as-welded condition and that the tensile speci­mens, bend specimens and chemical analysis meet the requirements of ASME Section IX’s latest edition and addenda. Figure 2 shows the general arrange­ment of the face and root bend speci­mens, the mass spectrometer specimen, and the reduced section tensile specimens as they were removed from the weld test coupon. The ASME Section IX requirements for the mechanical testing of this proce­dure qualification test called for two ten­sile specimens be removed and tested. Each tensile had to exceed the minimum requirement of 58,000 lb/in.2 (400 MPa) ultimate tensile strength. ASME Section IX also requires that four bend speci­mens be removed and tested in accor­dance with and to the acceptance crite­ria of ASME Section IX. Table 4 shows the results of the ten­sile and bend tests of the seven proce­dure qualification tests run with the recycled SAW flux. It can be seen that for each of the seven procedure qualifica­tion tests performed, the tensile speci­mens far exceeded the requirement, and all fracture locations were in the base metal and ductile in nature. Also, Table 4 shows that all bend specimens were acceptable in accordance with ASME Section IX requirements. Type Reduced Sec. Reduced Sec. Reduced Sec. Reduced Sec. Reduced Sec. Reduced Sec. Reduced Sec. Reduced Sec. ASME Section IX also requires that a chemical analysis of the deposited weld metal be made of each procedure qual­ification test coupon. Since the objec­tive is to have a mild steel weld deposit, the weld is required to meet the criteria of A-No. 1 in accordance with ASME Section IX. These requirements call for 0.15% carbon maximum, 1.60% man­ganese maximum and 1.00% silicon maximum. Table 5 shows the results of the chemical analysis of the weld deposit for the seven tests made with the recy­cled SAW flux. In all seven procedure qualifications, it can be seen that the re­quired chemical elements were below the maximum requirement of ASME Section IX. The chemical analysis of the proce­dure qualifications shown in Table 5 were performed by the wet analytical method for one through six. The chemi­cal analysis of the procedure qualifica­tion for test seven was performed by mass spectrometer. Since it’s easy to get the re­sults for additional elements using mass spectrometer, recycle test seven was also analyzed for sulfur, phosphorous, and copper. It was found that the sulfur was 0.02%, phosphorus 0.019%, and copper 0.23%. In referring to Table 1, it can be seen that the levels of sulfur, phosphorus and copper would have been acceptable even with certification testing in accor­dance with AWS A5.17-89. The requirements of the American Welding Society’s D1 .1-94, Structural Welding Code-Steel, for certification testing of recycled slag can be accom­plish on a consistent and repeatable basis. The requirements of the American Society of Mechanical Engineers’ Boiler & Pressure Vessel Code Section IX, Welding and Brazing, for procedure qualification testing of recycled slag can be accomplished on a consistent and re­peatable basis. Submerged arc welding slag recy­cling programs should not be entered into without testing to prove the recy­cled product will have no detrimental effect on the weld deposit. Welding fabricators must evaluate the test results, choice of new flux, and make a commitment to keep contami­nants out of the slag to be recycled. Welding fabricators must be as­sured that they will only receive recy­cled flux from slag they have generated and kept from being contaminated. 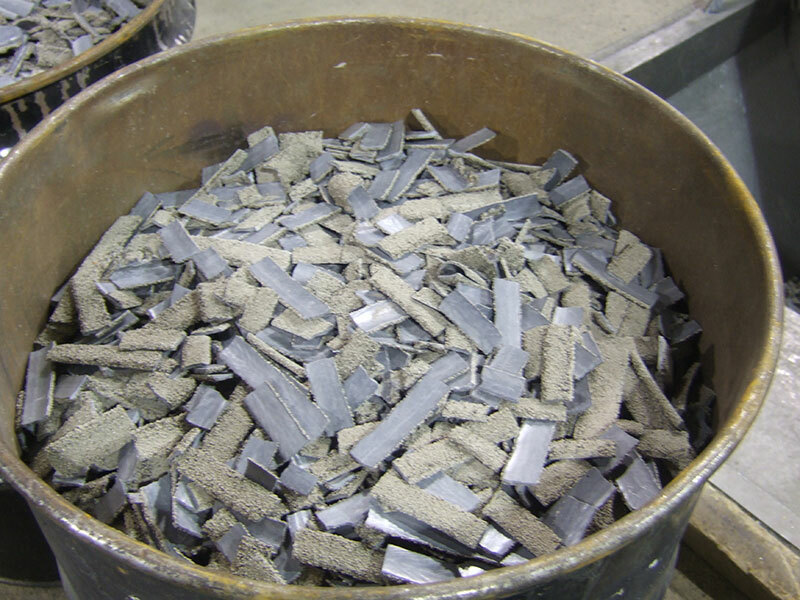 The recycling of SAW slag into SAW flux is a feasible alternative to buy­ing new flux for SAW process users. Re­cycling provides economic benefits to companies and it allows them to be en­vironmentally responsible. Let us show you how to help reduce your SAW welding costs as well as reduce your companies’ environmental footprint. By crushing your flux/slag, you will use less new flux, drastically reduce your material disposal cost, save landfill space, and be more environmentally proactive. Contact Harbert’s Products, Inc. today to learn more!